What’s the big deal about vocabulary? 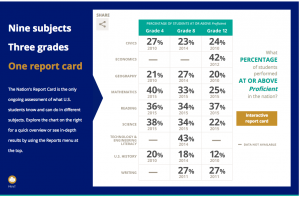 Every 2 years our nation’s 4th , 8th and 12th grade students are assessed in reading. The 2015 results indicate only 34-37% of these students are comprehending what they read. That means roughly 65% of students in the U.S. are not comprehending what they are reading. 2/3 of students in the U.S. struggle with reading comprehension. Vocabulary is a building block for reading comprehension. The struggle is real and we have a solution. InferCabulary uses images first, then words to help students understand vocabulary in a variety of contexts. Students tell us it’s a great way to learn and the word meanings are easier to remember because of our kid-friendly definitions. 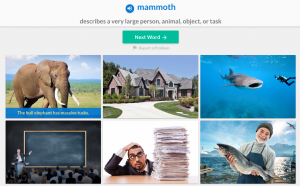 Check out our instant demo for yourself and see why students are teachers are loving this new way of learning vocabulary. We care about vocabulary, because it’s a big problem – one of mammoth proportions, you might say!